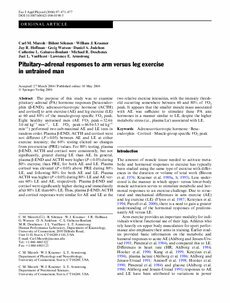 The purpose of this study was to examine pituitary-adrenal (PA) hormone responses [beta-endorphin (beta-END), adrenocorticotropic hormone (ACTH) and cortisol] to arm exercise (AE) and leg exercise (LE) at 60 and 80% of the muscle-group specific VO2 peak. Eight healthy untrained men (AE VO2 peak=32.4+/-3.0 ml kg(-1) min(-1), LE VO2 peak=46.9+/-5.3 ml kg(-1) min(-1)) performed two sub-maximal AE and LE tests in random order. Plasma beta-END, ACTH and cortisol were not different (P>0.05) between AE and LE at either exercise intensity; the 60% testing elicited no changes from pre-exercise (PRE) values. For 80% testing, plasma beta-END, ACTH and cortisol were consistently, but not significantly, greater during LE than AE. In general, plasma beta-END and ACTH were higher (P<0.05) during 80% exercise, than PRE, for both AE and LE. Plasma cortisol was elevated (P<0.05) above PRE during 80% LE, and following 80% for both AE and LE. Plasma ACTH was higher (P<0.05) during 80% LE and AE versus 60% LE and AE, respectively. Plasma beta-END and cortisol were significantly higher during and immediately after 80% LE than 60% LE. Thus, plasma beta-END, ACTH and cortisol responses were similar for AE and LE at the two relative exercise intensities, with the intensity threshold occurring somewhere between 60 and 80% of VO2 peak. It appears that the smaller muscle mass associated with AE was sufficient to stimulate these PA axis hormones in a manner similar to LE, despite the higher metabolic stress (i.e., plasma La-) associated with LE.